Topics: Shop, Faqs, and Find Us. The site has about 40 users daily, viewing on average 1.90 pages each. 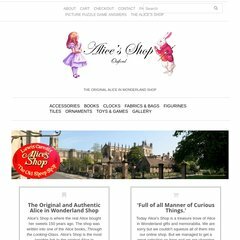 Aliceinwonderlandshop.co.uk's server IP number is 82.165.67.154. It has 2 DNS records, ns60.1and1.co.uk, and ns59.1and1.co.uk. PING www. (82.165.67.154) 56(84) bytes of data.